Taking into account the wind of change in economic front sweeping the globe, the apex court has felt the need for “expanded” interpretation of industrial laws keeping in mind the interests of both industries and workers, saying merely the “worker-oriented” approach will not boost industrial activities in the country. The mere inclusion of a private land in a city development plan as green area would not permit the government to deprive its owners from using it for residential purposes, unless it was legally acquired by the authorities, the Supreme Court has ruled. Nine political parties, including the Congress, the NCP and the dissident Trinamool Congress, at a meeting in the city today formed the Progressive Democratic Alliance (PDA) to fight the CPI(M) and other Left parties in the forthcoming municipal elections and subsequently, the state Assembly poll next year. Mr Jyoti Basu has invited the TDP to join the Left parties and be a partner of the anti-BJP alliance. Hyderabad: The decision of the Telugu Desam Party to ignore the pleas of the BJP leadership on continuing the Parliament boycott has more to it than meets the eye. Along with the rising mercury, political scenario in Tamil Nadu has heated up because of two byelections scheduled on May 14. Although the law and order situation in Punjab during 2004 remained under control, intelligence inputs suggested efforts continued to be made to revive militancy in Punjab but with little success, the Ministry of Home Affairs in its Annul Report 2004-05 has said. Facing attack from the Opposition for not acting against “tainted ministers”, Prime Minister Manmohan Singh yesterday said that steps taken by the late Prime Minister Lal Bahadur Shastri to eliminate corruption and restore faith in governance assumed significance. Old and abandoned mothers bless indifferent children on Mother's Day in Ahmedabad. The United Nations has named Dawood Ibrahim, underworld don and the alleged mastermind behind the 1993 serial blasts in Mumbai, in the wanted list of individuals having links with Al-Qaida. His name figures in the list under the UN resolution 1267 that mandates all states to freeze the assets, prevent his entry into or transit through their territories. Rajya Sabha MP (Congress) Ashwani Kumar has taken strong exception to NDA Convener George Fernandes’ remarks on the “UPA government’s witch-hunt” reported in a national daily today. Dehra Dun: With growing concern of Maoist infiltration into the border districts of Uttaranchal after the lifting of Emergency in the neighbouring Nepal, the government has plans to organise patrolling of the river Kali that separates the two countries. The river, which forms a large part of the soft border will be raft patrolled by the security agencies responsible for the border security. Union Home Minister Shivraj Patil today said India was keen to ensure restoration of democracy in Nepal at the earliest. Chinese Prime Minister Wen Jiabao’s first visit to India last month was significant not only for political and economic reasons, but also from the point of view of promoting religious tourism. Accepting that the Naxalites in the state took advantage of negotiations with the government to regroup and reorganise themselves, Andhra Pradesh Chief Minister Y.S. Rajashekhara Reddy today said that there was no question of any further negotiations with the rebels unless they laid down arms. Sardar Vallabhai National Police Academy officials have initiated an inquiry into the sordid episode of a clash between IPS probationers and local residents, resulting in grievous injuries to both sides. A huge racket of tampering with answer-sheets by students and peons belonging to Anna University has been unearthed. BJP Vice-President Mukhtar Abbas Naqvi will lead a six-member delegation of party MPs to Muree, near Islamabad, on May 13 for a conference of the South Asian Free Media Association (SAFMA). Gangetic river dolphins struggling to survive. “In interpreting, therefore, the industrial law, which aims at promoting social justice, interests both of employers, employees and in a democratic society, people, who are the ultimate beneficiaries of the industrial activities, have to be kept in view,” a five-Judge Constitution Bench, headed by Chief Justice R.C. Lahoti has held. “Exploitation of workers and the employers has to be equally checked. Law and particularly industrial law needs to be interpreted as to ensure that neither the employer nor the employee is in a position to dominate the other. Both should be able to cooperate for their mutual benefit in growth of the industry and thereby serve public good,” the court said, adding that the “worker-oriented” interpretation would not help the cause of employer and employees. The observation was made by the Bench, while considering an important question of law referred to it relating to the status of “social forestry” vis-à-vis industries and the position of workers engaged under the scheme with regard to the applicability of the Industrial Dispute Act as the prime aim of the scheme was protection of environment. Since the apex court’s seven-Judge Bench had earlier decided an identical issue with regard to the status of employees in the Bangalore Water Supply and Sewage Board case 23 years ago, the five-Judge Constitution Bench felt that “expanded” interpretation of the Act had also to be done by a similar Bench in the changed economic scenario. The Bench, comprising Chief Justice R.C. Lahoti, Mr Justice K.G. Balakrishnan, Mr Justice D.M. Dharmadhikari, Mr Justice Arun Kumar and Mr Justice B.N. Srikrishna, before coming to the conclusion, analysed several verdicts passed by the apex court during the past 23 years on industrial disputes. “The statute (Industrial Dispute Act) under consideration cannot be looked at only as a worker-oriented statute. The main aim of the statute, as is evident from its preamble and various provisions contained therein, is to regulate and harmonise relationship between employers and employees for maintaining industrial peace and social harmony,” the court observed. The court said an “over-expansive” interpretation of the definition of “industry” might be a deterrent to private enterprise in India, where public employment opportunities were scarce. Labelling professions like lawyers, chartered accountants, doctors and architects, which were occupations based on talent, skill and intellectual attainments, as industry, was a hurdle for growth of such profession when they give job opportunity to some people, the court said. The ruling was given by a Bench comprising Mr Justice Ashok Bhan and Mr Justice A.K. Mathur while disposing of petitions challenging the Maharashtra Government’s decision to dereserve a private land in the vicinity of Salisbury Park in Pune, which was earlier marked as green area in the development plan. The Trinamool Congress, however, has not joined in the new anti-CPl(M) block. The Mayor, Mr Subrata Mukherjee said they had formally invited Ms Banerjee to join the front but she had not responded. The Defence Minister, Mr Pranab Mukherjee, however, hoped Ms Banerjee would soon join them and fight against the CPI(M). The CPI (M) state secretary, Mr Anil Biswas did not give any importance to the formation of the alliance which he felt would die a premature death as it would not be acceptable to the people. Mr Mukherjee who is also WBPCC(I) president, today formally announced the formation of the new front at the convention at Calcutta University Institute Hall in the presence of Mr P.S. Sangma and Mr Tarik Anwar of the NCP and Congress leaders, Priya Dasmunshi, Mr Ghani Khan Chaudhury, Mr Somen Mitra and Calcutta Mayor, Subrata Mukherjee. The PDS leaders, were also present. The Mayor and several other dissident TMC leaders who were present at the convention claimed that soon several other prominent TMC MLAs and other important leaders would also join the front. All nine parties have already decided to share seats among themselves in the coming elections on mutual understanding against the Left parties so that the anti-Left votes are not divided, said Mr Mukherjee. He also asked other non-BJP partners to leave the NDA and join them for stepping up the formation of the third front. Talking to mediapersons at his party’s Alimuddin Street office on Friday, the veteran CPM leader welcomed the TDP’s decision to participate in the Lok Sabha proceedings, defying the BJP’s decision to continue with the boycott. Mr Basu said it was a right decision taken by the TDP, though taken lately. The development is seen here a sign of the two pre-poll allies moving away from each other and the TDP’s new -found enthusiasm for the comrades for the revival of an elusive third front. Party chief N. Chandrababu Naidu has said that the decision had been taken to raise issues of public importance in the House. Speaking to reporters in Chennai on Friday, Naidu stuck to his known stand: the “TDP is not part of the NDA, and we have been extending only issue-based support to the BJP”. However, insiders say that Naidu, who has been uncomfortable sailing with the BJP since the alliance was drubbed in the last May poll, is finally moving towards an eventual break-up with the saffron party. But even in this, party leaders say, Naidu would not like to force things hastily as he is not too sure of alternatives. Partymen have been telling him that the Left was the party’s natural ally and that the association with the BJP had only tainted the secular character of the party with out any concurrent benefits. To demonstrate his Left shift, Naidu was prompt to condemn Advani last month for his address at the party’s national executive meeting, which reiterated the party’s hardline Hindutva. Earlier in the week, twice did Naidu want to ignore the Parliament boycott, but Advani prevailed upon him. While for Tamil Nadu Chief Minister J. Jayalalithaa it is a litmus test for the Dravida Munnetra Kazhagam (DMK) led-Democratic Progressive Alliance (DPA), it is important as the bypoll is being seen as an indicator of the electorate mood in view of the state Assembly elections due in May next. Both the Gummidipoondi and Kancheepuram Assembly seats were held by the ruling All-India Anna Dravida Munnetra Kazhagam (AIADMK). If the DMK can wrest the seats, it will be a shot in the arm for the DPA which will begin its campaign much ahead of the Assembly elections with a gusto. For the Jayalalithaa government, the byelections outcome will not make any difference as it enjoys a comfortable majority in the Assembly, but it will be the writing on the wall for her. Other than her whirlwind tour of the two constituencies several times, Ms Jayalalithaa has deputed eight ministers in the Gummiidipoondi constituency alone as it is considered to be an AIADMK stronghold since 1977. However, during the last Lok Sabha poll, the DPA got 32,000 votes more than the AIADMK in this Assembly segment. The DMK leaders are upbeat as they feel that the anti-incumbency factor will help their candidate along with issues like closure of industrial units, bad roads, scarcity of water and deteriorating law and order. In fact, the DMK leaders are campaigning on the reason behind the bypoll. It was necessitated because the former sitting AIADMK MLA K. Sudarsanam was murdered by dacoits. They feel that the AIADMK nominee, Mr Vijayakumar, Sudarsanam’s son, would not get sympathy votes. Moreover, the caste factor with 30 per cent of the 1,93,325 voters being Backward Vanniyars and another large chunk being Dalits, among whom the DPA has a strong support base, gives its candidate an edge. However, the AIADMK camp does not seem to be worried as its leaders feel that there is a strong sympathy wave in favour of Mr Vijayakumar since his late father was a popular legislator. The party leaders are confident that since a majority of the voters are women, Ms Jayalalithaa’s charm would work and the performance of the state government and the roll back measures by the Chief Minister after the Lok Sabha poll would romp their candidate home with victory. The AIADMK is also exploiting the factionalism within the DMK over the allocation of the party ticket to Mr P. Venkatachalapathy and banking on the fact that there is a Dalit Panthers nominee who would eat into the DPA votebank. “Top leaders of Sikh militant groups, including Wadhawa Singh (BKI chief), Paramjit Singh Panjwar (KCF/P chief), Lakhbir Singh Rode (ISYF/Rode chief), Ranjit Singh, alias Neeta (KZF chief) and Gajinder Singh (DKI chief) continue to take shelter in Pakistan,” the 183-page report said. 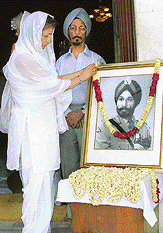 Besides, Radio Pakistan, in its daily programme titled ‘Punjabi Darbar’, continued its focus on trying to subvert Sikhs and thus creating a wedge between Hindus and Sikhs, it said, adding that the central government continued to be in close touch with the state government and kept a close watch on the situation and remained committed to ensuring that militancy in Punjab was not revived by anti-national elements. “The government is also pursuing its efforts to secure the apprehension and deportation of Pak-based pro-Khalistan militants to India,” it added. Regarding the Liberation Tigers of Tamil Eelam (LTTE), the MHA report said the LTTE insistence on recognition of Sea Tigers as a separate unit by the Sri Lankan Government posed yet another threat to Indian security. “The LTTE continues to use the State of Tamil Nadu as a base for carrying out smuggling of essential items like petrol and diesel besides drugs to Sri Lanka,” it said, adding that the organisation continued to be an extremely potent, most lethal and well-organised terrorist force in Sri Lanka and had strong connections in Tamil Nadu and certain pockets of southern India. “The LTTE assiduously cultivates the Tamil chauvinist elements who are inspired by the Tamil Eelam concept of a separate Tamil Nadu i.e. secession from India,” it said. “The LTTE, by carrying out several successful suicide-killing missions in Sri Lanka and one in India, has emerged as one of the deadliest terrorist organisations in the world, which has sympathisers, supporters and agents on the Indian soil,” it added. Inaugurating Lal Bahadur Shastri Memorial here, the Prime Minister said the late leader electrified the nation with his soul-stirring slogan ‘Jai Jawan, Jai Kisan’. He said as Home Minister, Shastri was instrumental in appointing one of the first-ever committees on prevention of corruption. Dr Singh said Shastri was a trusted leader, a freedom fighter, a distinguished parliamentarian and an outstanding human being. Dr Singh lauded Shastri’s contribution in laying the foundations of food security in the country, saying that the people were indebted to the late leader for the present day success of the White Revolution. The National Dairy Development Board (NDDB) was formed in 1965 during Shastri’s tenure as Prime Minister and this project has since helped the country in creating self-sufficiency in milk production, trebling the nation’s milk production within a span of two and a half decades, he said. Among those present were former President R. Venkataraman, former Prime Minister Atal Bihari Vajpayee, Information and Broadcasting Minister S. Jaipal Reddy, Home Minister Shivraj Patil and two sons of the late Prime minister — Anil Shastri and Sunil Shastri. In a statement issued here today, he said by imputing a witch-hunt by UPA Chairperson Sonia Gandhi, the NDA Convener had “reduced the idiom of political discourse to a new low”. “The expressions used by him mock the sensitivity of the people of India and are offensive to the sensibilities of women in general,” he said. The Sashastra Seva Bal (SSB) along with other paramilitary forces and the Uttaranchal police would work in tandem to increase vigil along the border. Several places along the river provide channels to infiltrators, insurgents looking to crossover and even smugglers in the area with little or no motorable roads. Out of the 265 km border that divides the state from Nepal, over 200 km is hill terrain without roads. Lack of roads and the presence of easily accessible locations along the river are the biggest challenges the forces are faced with in patrolling the region thoroughly. According to SSB officials, the river patrol will begin from Jaujibi in Pithoragarh district to Pancheshwar and all the posts and battalions would be provided with a motor raft each for 24-hour patrolling. The decision to launch river patrolling is likely to help the security agencies to monitor the border better. However, parts of the border will still be out of reach for patrolling due to lack of roads which is an issue the paramilitary forces hope the Centre will address by building roads as a part of the Border Areas Development Plan. Besides the patrol, at least six new posts will be set up along the border at Garbadhar, Lamari, Boondi, Garbyang and Kali Pani next month, officials said. The new well-equipped posts would also help the raft patrollers. However, it would not be before July that the SSB would begin river patrol since the process of purchasing the rafts fit for patrolling would take time, officials said. Senior officials from the security agencies, including DIG (SSB) Aditya Mishra, visited border areas to review the situation. The officials said they were in the process of identifying the important areas to mark them for patrolling. Addressing members of the SAARC gender and working group at a regional conference of parliamentarians and civil society, the Home Minister said it was up to the people of Nepal to decide whether they wanted to have monarchy or any other system, but India wished that democracy prevailed in Nepal. Mr Patil stressed on the need for reducing defence spending in the SAARC region and said it would fetch peace dividends. He said SAARC nations needed to take a leaf from the experiment of the European Union that had brought economic gains to all member-States. The Home Minister said the SAARC region was characterised by a similar culture, customs, traditions and problems and there was a need for closer ties for resolving issues related to trade, investment, services, exchange of skills and technology. On rampant trafficking in women across borders, particularly the India-Bangladesh border, Mr Patil said India and Bangladesh should work together to put an end to this practice. Commenting on the adverse balance of trade with Bangladesh, he said the two countries should hold a dialogue to see how exports from Bangladesh could be enhanced. Chinese Prime Minister Wen Jiabao’s first visit to India last month was significant not only for political and economic reasons, but also from the point of view of promoting religious tourism. During his April 9-11 visit, Dr Manmohan Singh raised the issue of China seriously considering a proposal to open an alternative route to Kailash Mansarovar through Ladakh to make travel shorter and more convenient. The Chinese side is believed to have responded positively to the suggestion, saying it would help Hindu pilgrims from India. Singh is said to have raised the issue after PMO and South Block officials conducted a computerised draw for the selection of this year’s yatris. The computer-generated, gender-balanced random selection process was carried out for a total of 704 slots across 16 batches for the yatra scheduled to begin on May 29. “The allegations are not far from true. They regrouped and strengthened themselves while the government was putting all its effort to bring them to the dialogue table,” said Reddy in an exclusive interview with ANI on completion of one year in office. “They did that and so we said that unless they lay down arms, further negotiations cannot take place. We wanted to give them an opportunity and, if they don’t want to use the opportunity, it’s left for them,” he added. The Chief Minister also said that the government was making all efforts to address the social, political and economic problems to check the strengthening of Naxalites. The trainees could face charges of homicide if one of the injured, who is battling for his life in hospital, does not survive. Four trainee IPS officers got into a brawl with a cigarette kiosk owner and his son after a night out in a bar on Sunday last and beat up shopkeeper K. Siddappa and his son Venkatesh, leaving the former in a semi-conscious state. The Rajendranagar police initially tried to put the blame on Siddappa and his family and registered an attempt to murder case against Venkatesh and none against the trainees. However, public outcry and Siddappa’s deteriorating condition in the hospital forced the local police to tone down the severity of the charge against the vendors to causing hurt with dangerous weapons. To appear even-handed, the police had to register cases against their future bosses on two minor counts, voluntarily causing hurt and damage to the property. Academy director Kamal Kumar, who is looking into the issue, asserted that appropriate action would be taken against erring cadets. According to eyewitness accounts, the probationers Keval Khurana, Anand Prakash Tiwari and Irshad, picked up a quarrel with Siddappa when he charged them extra for a pack of cigarettes costing Rs 59. They allegedly dragged Siddappa out of the shop and assaulted him, even while shoving Venkatesh who came to rescue his father aside. Enraged by the attack, passersby attacked the trainees and injured them. Meanwhile, one of the probationers, Irshad rushed to the academy and returned to the scene with 20 colleagues who chased away the locals. Two of the trainees, Khurana and Tiwari, received injuries in the scuffle and were treated at Apollo Hospital at Jubilee Hills. A huge racket of tampering with answer-sheets by students and peons belonging to Anna University has been unearthed. Ten students, who appeared in different examinations in various self-financing colleges affiliated to the university, and six peons working in private engineering colleges have been arrested in this connection. The bribery scandal may run into several crores. The Chennai Police Commissioner Mr R. Natraj, said, “The duplicate answer-sheets were written on the same day with the help of textbooks and other aids and handed over to the authorities before the numbering of the answer-sheets by supervisors and then sent to evaluation centres. This cannot be possible without the connivance of several supervisors”. The modus operandi was simple. Students appearing for exams contacted a tout to get back their answer-sheets, rewrote their exams at leisure on a fresh set of papers and substituted these. Peons replaced the papers after charging Rs 10,000. The first pages of the fresh sheets were removed and replaced with the ones containing the signatures of the supervisors, police sources said. So far, Valliamai Engineering College on the outskirts of Chennai has come in for adverse notice. But the police suspect more institutions are involved. The role of a supervisor is being investigated into. The role of storekeepers who had control over the unmarked answer-sheets is also being investigated into. The kingpin is said to be one Vijaykumar, who is absconding. The police has seized Rs 9.86 lakh so far. According to FOGSI, the ‘Safe Motherhood’ initiative, aims to increase public awareness regarding various issues related to delivery and possible alternatives in modern obstetric care. The federation has identified Bhavnagar and Palanpur in Gujarat, Ajmer and Kota in Rajasthan, Loni and Palghar in Maharashtra and Allahabad and Gorakhpur in Uttar Pradesh for the workshop to reach out to a large rural population. Former BJP ministers, Ravi Shankar Prasad, Satya Narayan Jatiya, Kiran Maheshwari, and MPs, Uday Singh and A. Khanna, would accompany him for the week-long conference beginning on May 14, he said here today.